April 04, 2019: The Kerala education board has announced the examination dates for its SSLC and DHSE exams for 2019. As per the announcement, the Kerala DHSE (Class 12) exams will be conducted from67 March, 2019, and end on 27 March, 2019. The Kerala SSLC (class 10) exams will be conducted in the month of March and commence from 13 March 2019 and continue till the 27 March, 2019. The timetable for the SSLC exams can be found here and that for the DHSE exams can be found here. 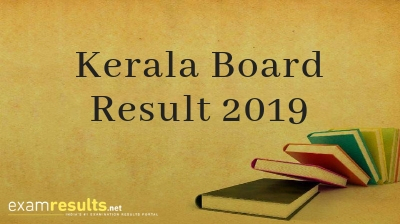 The Kerala board results 2019 can be checked on this website and our Android app, which will not only feature the Kerala SSLC result 2019 and the DHSE plus two result 2019 but also give you exams- and results-related notifications. Students can also join our Facebook group to get the latest updates on the Kerala education board results 2019. Kerala Board of SSLC and DHSE Education has declared the exam dates for the board examinations. Kerala Board SSLC and DHSE Examination will begin on 13th March and 6th March 2019 respectively. Kerala results will announced in the month of May 2019. In the year 2018, the Kerala exam results were announced in May. This year, too, the Kerala result 2019, is expected to be announced around the same time, tentatively in the 3rd week of May. We will update the exact time and date as soon as the information is released by the official authorities. Other information we release will include name-wise results, pass percentage, number of candidates, gender-wise pass percentage, names of toppers, etc. We published the Kerala plus two results and the Kerala SSLC results for 2018 on our website, examresults.net/kerala/. The results are also announced through the official website of the Kerala board. Type the desired state name, for example, examresults.net/kerala/. Click on the link and fill in your details, including Registration Number and Date of Birth, to get your Kerala education board Result 2019. The Kerala education board result 2019 now displayed will include information like your Hall Ticket Number, Name of the Student, Grade Points, and Result. Traditionally, the Kerala SSLC results are announced in either the last week of April or the first week of May. This year there is chatter that the results will be announced in May but there is no official confirmation about the dates. Similarly, the Kerala DHSE results 2019 are generally announced in the 2nd week of May but this year, in 2019, it could be postponed to the third week of May. 8.9 lakhs students sat for the DHSE and SSLC exams held by the Kerala board in 2017. In the year 2018, the overall pass percentage of students who appeared in the SSLC exam was 97.84% and for the DHSE exam was 83.75%. In the table below, you can check the pass percentage for the past two years for both, the Kerala SSLC exam and the Kerala DHSE exam. We will update this table with the pass percentage for 2019 once the results for this academic year are out. Students who've appeared for the Kerala SSLC 2019 and Kerala DHSE exams 2019 can check their Kerala education board results 2019 on the official website of the Kerala board or on examresults.net. SSLC students can check their Kerala examination result for 2019 on keralapareekshabhavan.in. DHSE Class 12th students can check their 2019 Kerala education board exam result on dhsekerala.gov.in. Students can also check the Kerala exam result by downloading our Android app which hosts results for a plethora of boards and will also show the Kerala board exam result for 2019. Stay tuned to this website for all updates and notifications related to Kerala education board results 2019. The Kerala State Education Board is also known as the Kerala Board of Higher Secondary Education. It is located on the 4th floor of the Housing Board building in Santhi Nagar in the capital city of Thiruvananthapuram, Kerala. The Board was established in the year 1990 to restructure the operations of Secondary and Collegiate Education in Kerala. There are quite a few private and government schools associated and affiliated with the Kerala Board. The board regulates the secondary school education system in Kerala and is responsible for the governance of course design, syllabus prescription, examination conduction, affiliations and accreditations, etc. The SSLC and DHSE Board exams are conducted by the Kerala Board every year and the Kerala exam results are declared by the Board as well. Certificates are provided to the qualified students by the Kerala Board.